The extraordinary drawings and works on paper by French artist Geneviève Seillé are an idiosyncratic combination of writing, numbers, collage, drawing and mark-making. 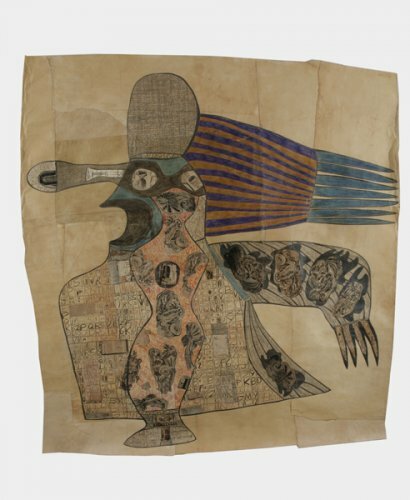 Seillé’s influences and sources are diverse, spanning graffiti, medieval books, musical notation, the work of Jean Dubuffet, tattoos, the arcane writings and drawings of Adolf Wölfli, Japanese kimonos, and all conceivable kinds of typography. A particular fascination dating from her childhood is with what she describes as “the beauty of lines called letters… the shapes that communicate thought… words are magic”. Seillé sees text primarily as a visual and aesthetic entity, and the pictorial or ‘concrete’ aspect of writing is a major component in many of her works. Born in France in 1951, Seillé came to England in the 1970s, where she lived for over two decades before she returned to south-west France. In response to feeling isolated as a foreigner in England, she began to devise her own “cosmology”. She once wrote that “there is a need to reinvent the world, to create your own world”, and the quasi-architectural structures in many of her drawings are her way of creating a kind of “order out of chaos”. Some of her drawings are made with graphite or ink, other works are collages thick with successive layers that seem to proliferate outwards. When writing about Seillé’s work, Clive James noted that “… every picture is much more than an assemblage: it’s a concentration, pulled together with unsleeping centripetal force. The apparent hunger for a synthesis, however, is meticulously selective… and a unifying form invariably emerges. The glance should linger, because the divinity is in the detail… “. Seillé keeps and adds regularly to an album of typographical and visual cuttings collected over many years, an eclectic collection ranging from tattoo designs to lettering rubbed from an ancient tombstone She often draws on this Scriptionary, and copies specimens to recycle them in her works; as seen in the series of stylized drawings of Personnages Tatouées, where the bodies are composed of text fragments and numbers, with collaged photo-copied drawings of tattoos and the addition of bands of strong colour. Seillé has exhibited in Britain, France and America; and with England & Co since 1992. Her work has been featured in Raw Vision magazine, and most recently in the 2011 Siglio Press publication, It Is Almost That: A Collection of Image & Text Work by Women Artists & Writers. A major essay about the artist by Professor Roger Cardinal – Geneviève Seillé: Beyond Reading – was published by England & Co in 2000 in the exhibition catalogue, Geneviève Seillé: Crossing the Sea of Ink. Seillé is represented in many international collections, including The Ruth and Marvin Sackner Archive of Concrete and Visual Poetry, Florida, USA, the Philadelphia Museum of Art, and the MacArthur Foundation, USA. Her book-works are represented in the National Art Library in the Victoria & Albert Museum in London. Geneviève Seillé has long admired, and acknowledges the influence of the work of Jean Dubuffet on her own practice. This exhibition of her drawings and constructions is accompanied by a collection of rare lithographs, lithographic posters and books that was recently on loan to Pallant House Gallery in Chichester as part of the exhibition, Jean Dubuffet: Transitions.